It’s that time again…hearty greens are in. Not only super good for you they are super delicious too. When I think of hearty greens I immediately think of collards. Cooked to death (not necessarily in a bad way, I love them) with some smoked meat product, maybe some onion and green bell pepper, with a dash of hot pepper vinegar. Yum! 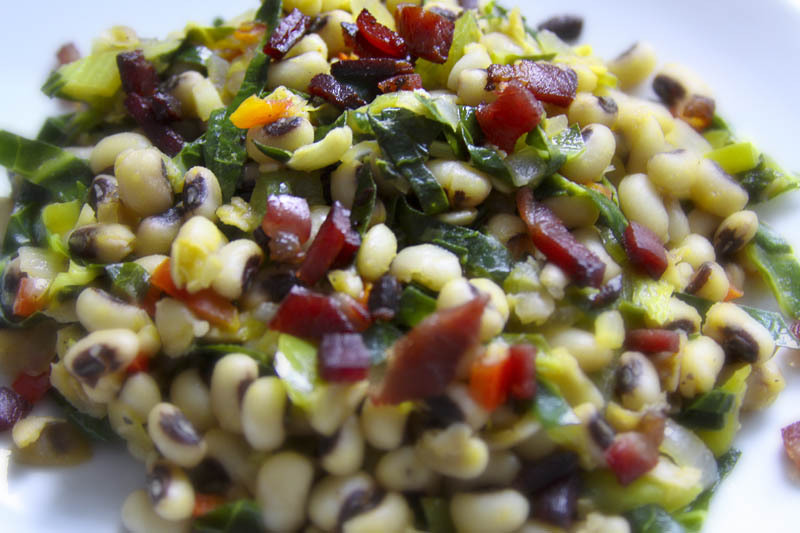 Or the traditional Southern New Year’s Day combo of black eyed peas and collard greens you should eat to insure luck (BEP) and prosperity (greens) for the upcoming year. Don’t just stop there... greens are incredibly versatile as well and there is a huge variety to work with; collards, Swiss chard, mustard, turnip, kale…all delightful in their own way. I have focused on chard and collards although the possibilities are endless, soups, casseroles, chips, slaws, stewed, sautéed, even raw! Also, check out our post from earlier this year for Yummy Juice (scroll down) recipe here ”Juiced raw collards?” you ask? They are delicious and remarkably sweet! Try something new but most importantly: EAT YOUR GREENS!!!!! In a 10 inch straight sided sauté pan over medium heat cook the bacon or country ham until crisp. Remove from the pan and set aside. Add the olive oil (if necessary) and the onions and peppers. Cook until they begin to get soft about 5-7 minutes, then add the garlic and cook a few minutes more. Add the celery leaves and collards and toss to combine. Add the black eyed peas and stock and raise the heat to bring to a boil. Reduce the heat and cover and cook for just a few minutes until the beans and collards are tender (not mush). Uncover and cook until most of the liquid has evaporated. Add the vinegar and taste for seasoning. Add salt and pepper if necessary. *If you use country ham your salt needs will be way less…also depending on your bacon and it’s salt content you may not need any extra here at all! In a bowl combine the turkey through ¼ cup Parmesan. Using a fork or your fingers gently work all the ingredients together being careful not to over work the mixture. Portion the balls into 1 ounce or tablespoon portions (I use a small disher) and place on a sheet pan in the fridge. Put the oil in a large pot set over medium heat. Add the onion and cook until the onions are soft, about 8 minutes, add the chopped chard stems and cook for a few minutes until they begin to soften. Add the tomatoes and cook until they begin to break down. And the stock and water and bring to a boil over high heat. 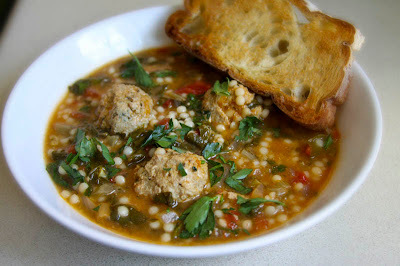 Reduce the heat and gently add the turkey meatballs, cover and cook for 5 minutes. Add the cous cous and chard leaves and simmer for another 10-12 minutes or until the cous cous is tender and the meatballs are cooked through. Remove from the heat, stir in the herbs, taste and add salt and pepper if desired and serve hot with Parmesan and some nice toasted or grilled crusty bread! If you can’t finish the whole pot freeze in individual portions and enjoy it later! I know you have only really heard of summer and winter. 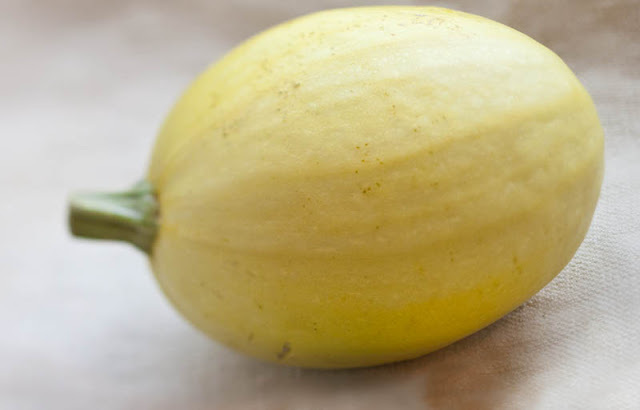 Well the following squash do actually fall into the winter category but they are the first of the winter squash to come in or be sold so I am calling them Fall squash. 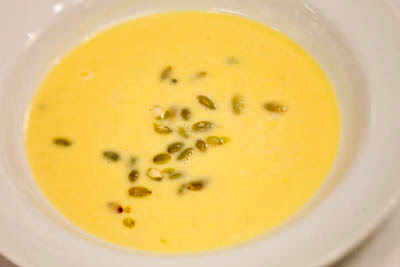 Winter squash are truly available but they are considered winter because they can “keep” into the winter months. 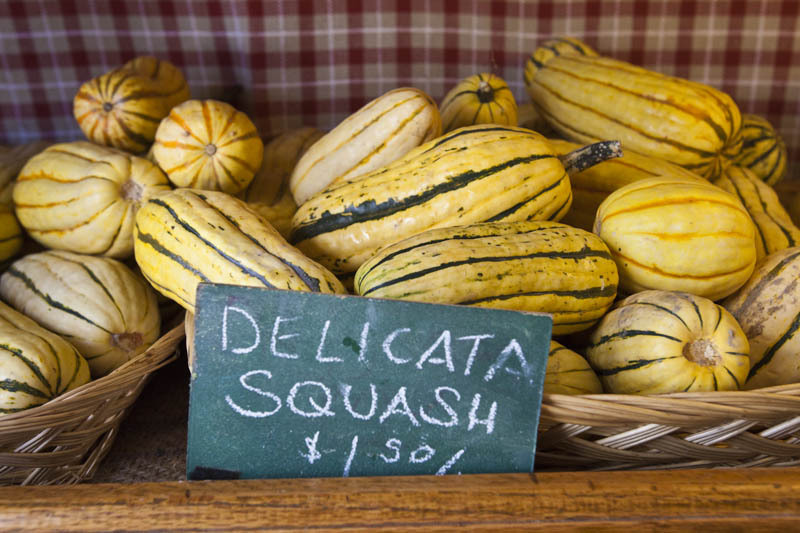 The Delicata Squash is an heirloom variety that has recently reentered the market. It is also known as sweet potato squash or peanut squash. 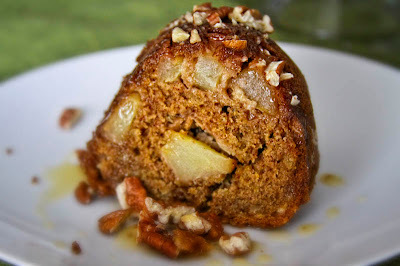 It is rather delicate in flavor, like a cross between sweet potato and corn. And the skin is actually edible, unlike most other winter squash, thinly sliced and roasted it is delicious. 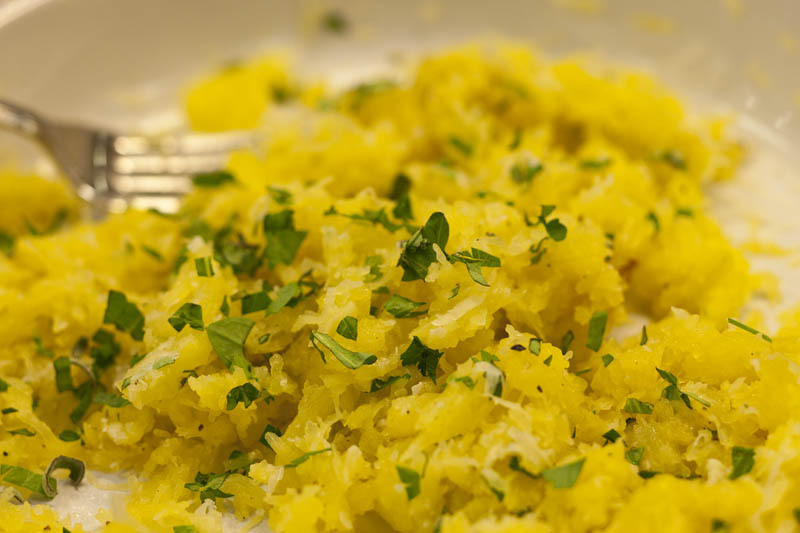 Spaghetti Squash is the other squash of interest. I love this vegetable because it is just cool and unexpected! Also, it super easy to prepare and good for you. Here are a few things to try with these great gourds! Heat an oven to 400°F. 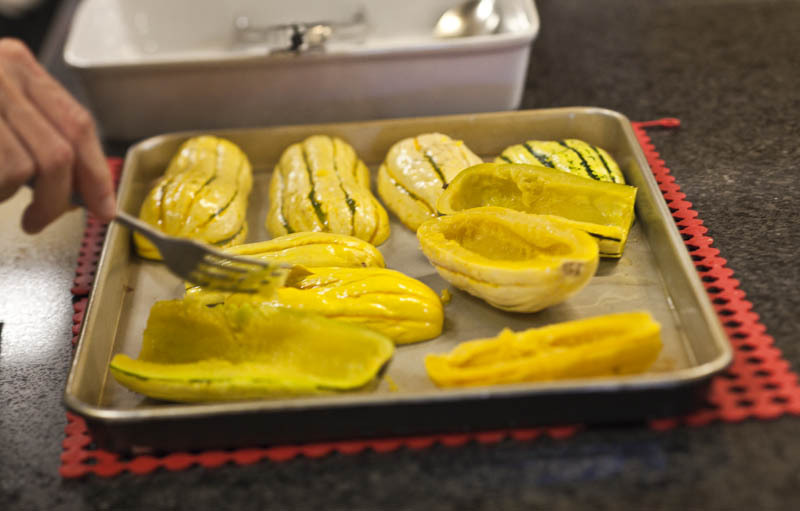 Place the squash halves, cut side down on a baking dish and add a little water to the pan. Cover with foil and roast for 45 minutes to an hour or until the squash is fork tender. Remove from the oven and allow to cool. 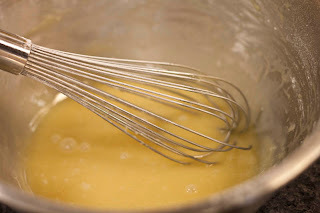 In a large pot set over medium heat melt the butter. Add the onions and cook until soft and beginning to brown, about 10 minutes. Remove the flesh from the roasted squash and add too the onions. Pour in the stock and cream and add a pinch of salt and cayenne. Reduce the heat to maintain a gentle simmer and cook for 25-30 minutes. ** For a side dish: cut the squash halves into wedges, rub with butter, sprinkle with brown sugar or maple syrup and salt and roast at 400°F on a baking sheet until tender, about 40 minutes. I usually just cut these babies in half, seed, dot with butter and cook in the microwave in a lidded glass dish with a little water until they are tender. This makes a great side dish with just salt, pepper, fresh herbs and freshly grated Parmesan. You can also use it as a pasta substitute and pour on your favorite tomato sauce and top with parm…yum. It is also a good way to get kids to eat some veggies! Bell peppers are here! And they are beautiful!!! Under appreciated these delightful veggies are so versatile! They originate from South and Central America and have been around for more than 9000 years. They are part of the nightshade family along with tomatoes, potatoes, and eggplant and they come in a variety of colors from green, yellow, orange, red, even brown, black and purple! The spice paprika is made from dried ground bell peppers. They contain good amounts of vitamin C, A, and B6. They are on the EWG’s dirty dozen list so be sure to buy organic if you can! 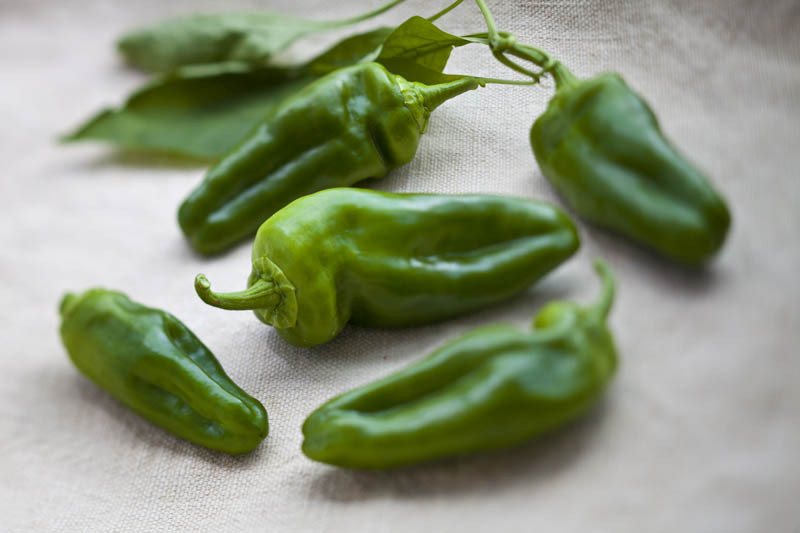 These recipes are rather simple but an easy way to enjoy the peppers, quality food doesn’t need a lot of fuss! 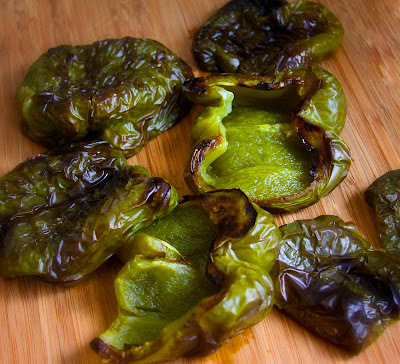 The roasted green bell peppers comes from a friend of mine Andrea. She brought these to a dinner party and I fell in love with them. Who ever thought of roasting green bells instead of red? I love it! Heat your oven to broil. Place the peppers cut side down on a sheet pan and place on the middle rack of the oven and broil until the skins are charred, about 15-20 minutes. Remove the peppers from the oven and place in a deep bowl and cover with a plate. Allow to steam for 5-8 minutes to loosen the skin. When the peppers are cool enough to handle remove the skins and discard. Tear the peppers into strips, toss with the lemon juice and season with salt and pepper. Store in a Ball jar covered in olive oil (try to remove all air bubbles that may form between the layers of pepper in the jar, I used a skewer). Store in the fridge. Use as antipasta, on a sandwich, or on a pizza! 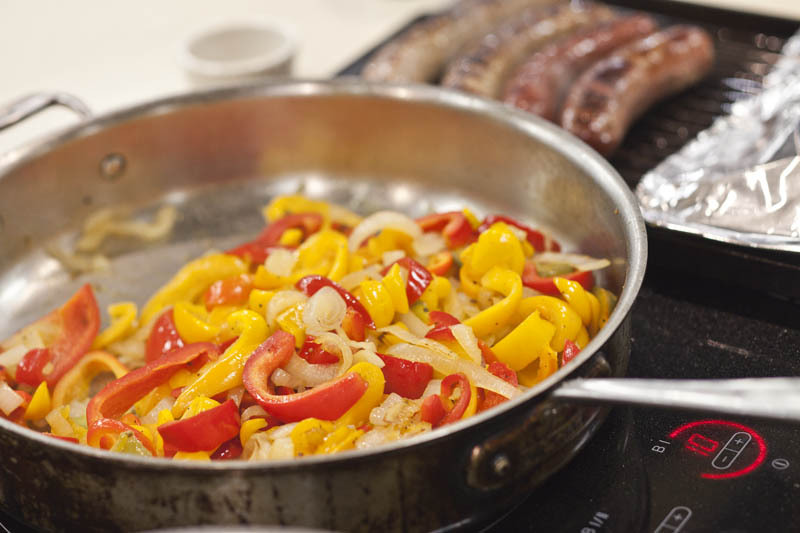 Heat the olive oil In a 10-inch straight sided sauté pan set over medium heat until it shimmers. Add the sausages and cook until brown on all sides and cooked through, about 10-12 minutes. Remove the sausages from the pan and keep warm. Add the onion and peppers to the pan and season with salt and pepper. Cook until soft, about 6-8 minutes and serve with warm sausages. To Grill to sausages: heat a grill to medium high. Grill the sausages until browned on all sides and cooked through, about 10-12 minutes. Serve with sauteed peppers and onions. Apples are coming in and I am happy. They make me think of fall, they make me think of school, they make me think of comfort. As a kid I didn’t really love them because thinking back they remind me of the tasteless red delicious apples you would get in the sack lunch provided by school on field trips to the zoo. Although as an adult I have tried many more varieties of apples and understand now the complexity this fruit has. I believe I have also found a good use for those boring red delicious apples (they make the best baby food and apple sauce). Is it true that an apple a day keeps the doctor away? Where did that come from anyways??? To Steam: Peel, core and chop fruit into 1/2-inch pieces. Place fruit and cinnamon (if using) in a steamer basket set in a pan with just enough water to come up to the bottom of the basket. Steam the fruit on medium high heat with the lid on for 8 minutes or until the fruit is tender when pierced with a fork. Stir the apples after a few minutes of cooking. Allow the apples to cool then puree and store. 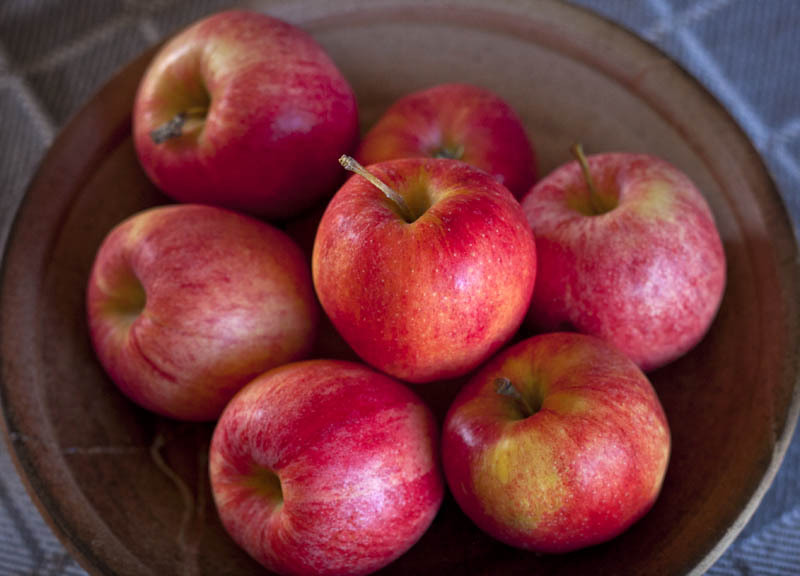 To Roast: Place washed and cored apples in a small glass baking dish. Add just enough water to cover the bottom of the pan and sprinkle with cinnamon (if using). Bake the fruit at 350 degrees for 45 min or until the fruit is tender. 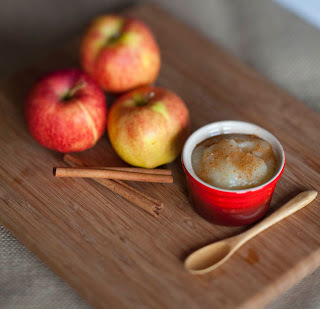 Allow the apples to cool then scoop the flesh with a spoon, puree and store. Storage: Allow cooked fruit to cool before pureeing and then again to room temperature (not exceeding 2 hours) before storing. Store in 4 oz. canning jars filled to 1 inch below the rim of the jar. This is called the “headspace” and allows room for expansion in the freezer. Freeze in 2-4 oz. portions. Thaw: Allow fruit to thaw in refrigerator over night. If you must quick thaw do so in the microwave in the glass jar on half power in 10-20 second intervals. Always check the temperature of your baby’s food before serving. You can thin out consistency with expressed breast milk or formula. Teething Trick: Steam peeled and cored apple slices for about 10 minutes then cool and freeze. Give to baby as a soothing treat for the gums! Apple Fact: Apples contain pectin, which can slow things down, but pectin also helps stimulate bacteria in baby’s bowels that help process solids. 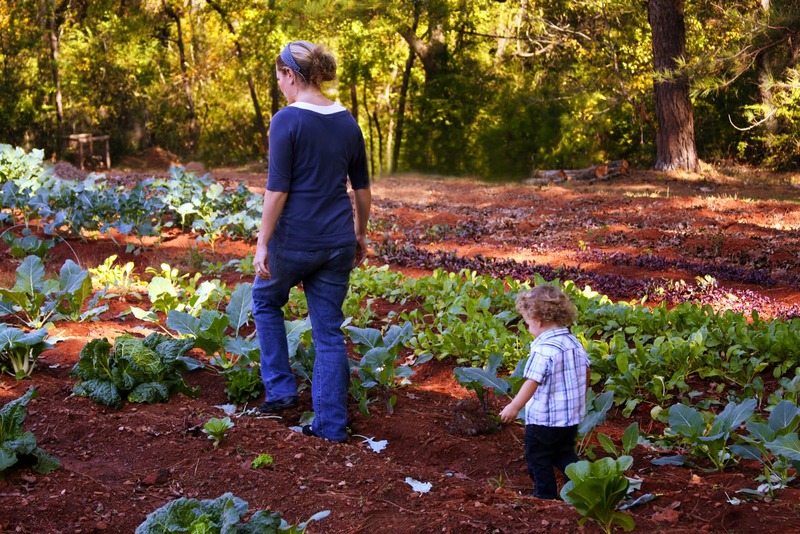 I asked my friend Tamie Cook, Culinary Director for Good Eats, to write this blog about the educational session she attended at the last Georgia Organics conference. I am a latecomer to the oyster bandwagon. I didn’t grow up with seafood loving parents and therefore was not exposed to much of it until I became an adult. I remember the first time I ate oysters and loved them. 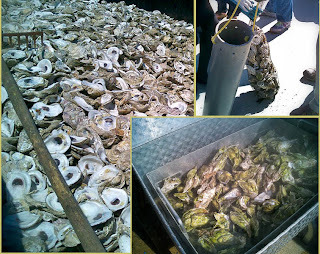 I was visiting some friends on Tybee Island GA and they suggested we go down to the dock and buy ‘a bag’ of oysters. I had no idea this bag would be 50 pounds and we would spend the rest of the day in the yard with the hose, scrubbing oysters. We shucked, and roasted, and ate a large portion of that bag. To this day when ever I have an oyster I think of that bag and remember it fondly. 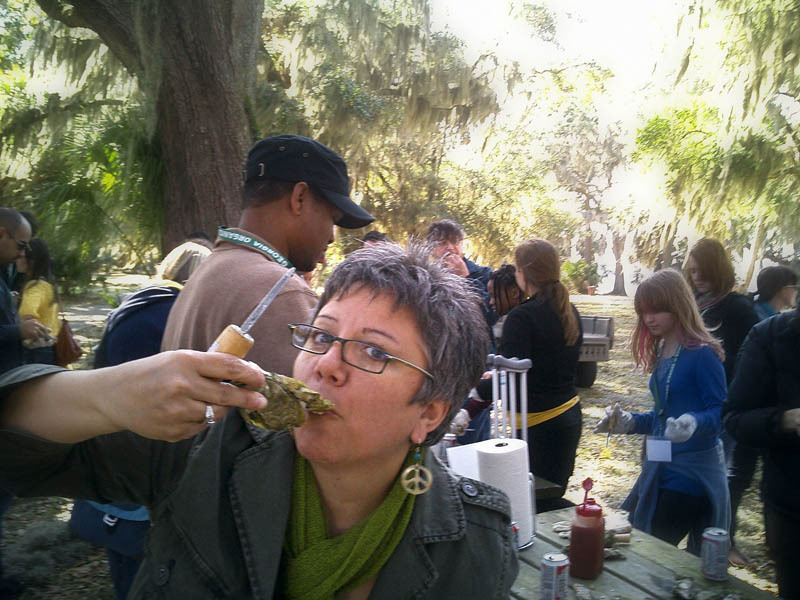 So in March when I had the opportunity to attend an educational session as part of the Georgia Organics’ conference, and one of my choices was a visit to SkidawayIsland’s Shellfish Research Lab and participate in an oyster roast, I signed up immediately. We toured the GEORGIA (Generating Enhanced Oyster Reefs in Georgia's Inshore Areas) project, which is a community-based oyster shell recycling and reef restoration project. 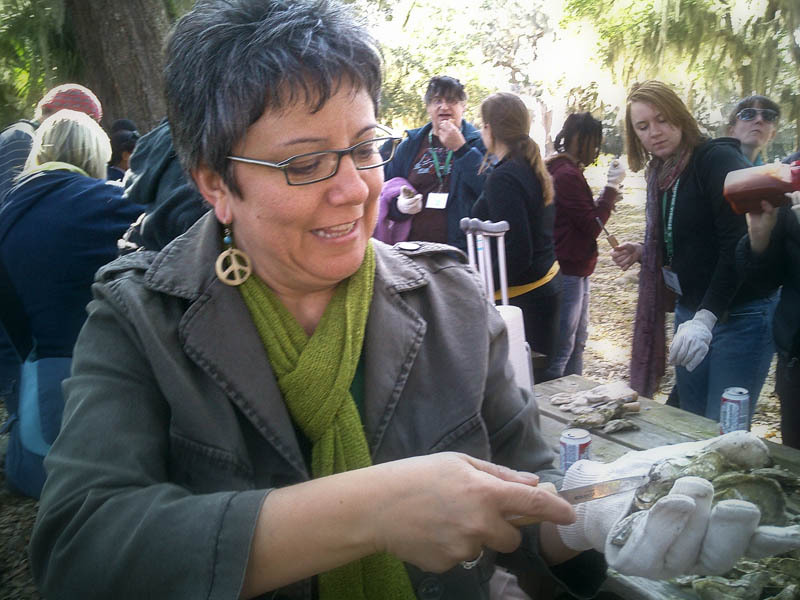 I learned how to recycle oyster shells and the importance of oyster reef habitats along the Georgia coast. The tour was followed up with oyster shell bagging, where we took large pieces of PVC pipe used as makeshift funnels, and fed the shells into mesh bags. Volunteers later would place these bags along Georgia oyster reef sites. The shells inside the bags create the substrate for oysters and other organisms to attach and grow during the upcoming spawning season. The program has been very successful in increasing the oyster populations of Georgia’s coast. 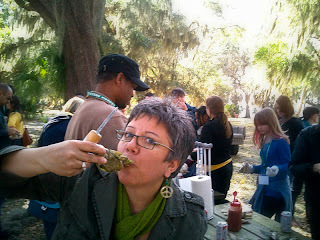 The reward for this work was an oyster roast on the banks of the Skidaway River. It was a beautiful, breezy afternoon and the local oysters were fresh and briny. I ate my fill and was once again reminded of that 50 pound bag many years ago. I am grateful to all the volunteers who have been working to make certain that many generations of oyster lovers to come can enjoy their own roasts. 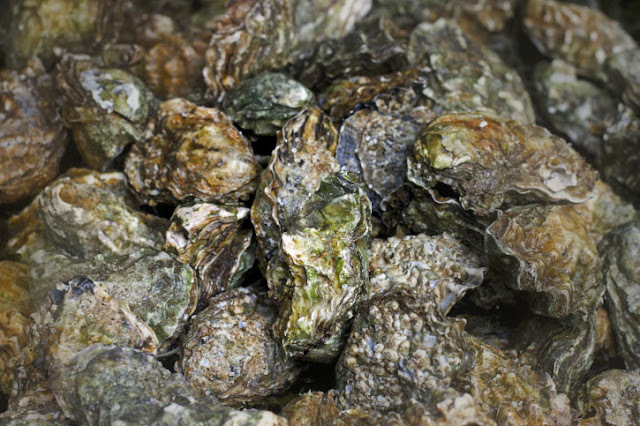 If you live in or around the Savannah or Brunswick area and are planning an oyster roast of your own, you can recycle your shells and contribute to the program. 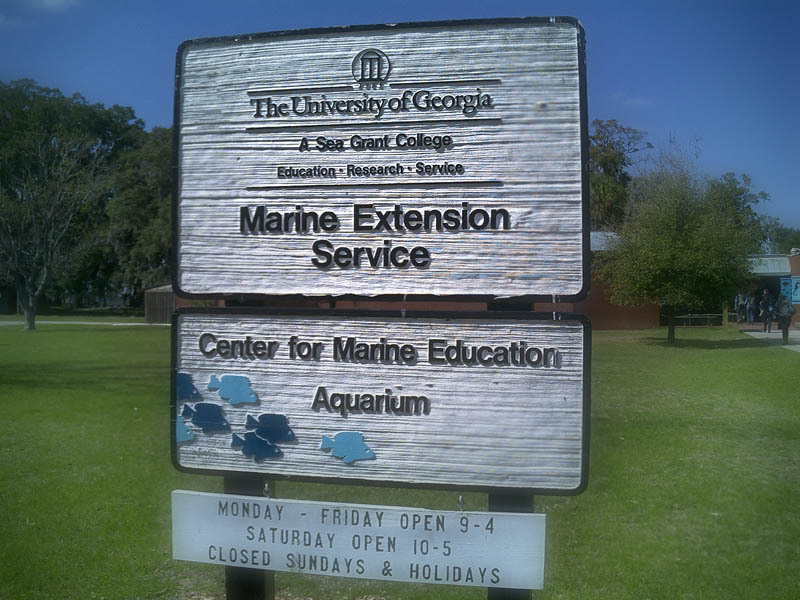 Contact the Marine Extension at 912 598-2348 to schedule a pick up or learn more about recycling centers. 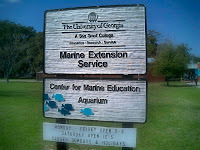 If you’d like to learn more about the program you can link to www.shellfish.uga.edu/oysterrest.html.